The ParaLens Advance is a microscope attachment designed to provide the benefits of LED fluorescence microscopy to any light microscope. LED fluorescence microscopy offers improved detection of many infectious diseases. The ParaLens Advance easily attaches to any compound light microscope as an objective. This allows users to upgrade their existing microscopes without wasting precious resources on unnecessary new equipment. The ParaLens Advance features a patent pending detachable filter set arm, which both streamlines the attachment for simple setup and allows users to quickly change between objectives whenever necessary. Please note: Most users will need one of the adapters listed below to use the ParaLens Advance. Unlike fragile, dangerous mercury or xenon bulbs, the ParaLens Advance LED light source is built to last. The bulb offers a life expectancy of approximately 20,000 hours, and its durable construction can withstand the roughest environments. The ParaLens Advance LED doesn’t sacrifice intensity for durability. Its light source is as bright as a 100 Watt mercury vapor bulb, allowing users to conduct sample reviews in virtually any lighting. Multiple Convenient Power Options, Anywhere in the World! The ParaLens Advance LED light source is designed to be powered easily, with a variety of convenient power options. The system comes standard with an AC to DC power pack and international plug adapters that can power the LED light source using any outlet in the world. Portable power options are also available for the system. The ParaLens Advance Portability Pack includes options such as a solar batter pack, USB cord, 9-volt battery clamps, and more. The QBC Mobile Power Station, meanwhile, is designed to power the ParaLens Advance as well as other QBC products, with a 22 Amp-Hour rechargeable battery and AC/DC inputs. This note demonstrates how the ParaLens Advance and the QBC F.A.S.T. AFB Kits can work together to assist with AFB reduction goals. The ParaLens Advance is designed to easily provide the benefits of LED fluorescence microscropy through its unique, patent-pending design. But what is fluorescence microscopy? And how does the design of the ParaLens Advance achieve these benefits? This section is intended to answer these important questions. Fluorescence microscopy has long been recognized as an important tool in many research and clinical applications, particularly the detection of infectious diseases. It utilizes principles of fluorescence to increase the visibility of objects seen under magnification, resulting in increased sensitivity and speed. To conduct fluorescence microscopy screening, a sample is first treated with a fluorescent dye. When light of a specific wavelength is directed onto the stained sample, the sample becomes excited and emits light of a new wavelength. The ParaLens Advance utilizes a blue LED light source and filters to produce an excitation output of approximately 410 to 480 nm. This is designed for use with a number of stains, most specifically acridine orange (used to detect malaria parasites) and auramine (used in the detection of acid-fast bacteria such as mycobacterium tuberculosis). The cutaway diagram to the right demonstrates the patent pending technology behind the ParaLens Advance. Standard RMS Threading (1) is used to easily attach the ParaLens Advance main body to any compound light microscope as an objective (Note: Adapter rings are available for non-standard sizes). All filters are contained in a detachable filter arm set (2) that can be removed to easily switch between objectives. The ParaLens Advance utilizes epifluorescence microscopy, meaning that the light is transmitted from above the sample, rather than passing through from below. The ParaLens Advance's light comes from its LED light source which attaches to the distal end of the filter arm (3), producing blue light with a 410-511 nm wavelength. After passing through the focusing lens (4), light in the filter set arm then passes through an excitation filter (5) that only allows light in the 385-480 nm range to pass into the main chamber. A dichroic beam splitter (6) directs blue light toward the sample where it will excite any substances that have absorbed fluorescent stain. The emitted light from the sample is focused by powerful objective lenses (7) as it travels back toward the viewer. The emitted light now has a longer wavelength than blue light which allows it to pass through the dichroic mirror. An emission filter (8) is present to reduce background noise and optimize the signal for viewing. How do I know if the ParaLens Advance will be compatible with my microscope? The ParaLens Advance is designed to be compatible with most microscopes that use standard RMS objective threading. Adapter rings are available for new Nikon, Leica, Zeiss, and Motic microscopes that use alternative objective threading. How often do I need to change the ParaLens Advance light bulb? The ParaLens Advance utilizes a high-intensity blue LED and should never need to be replaced. What is the excitation and the emission wavelengths of the ParaLens Advance? The ParaLens Advance provides an excitation wavelength of ~410-480 nm and an emission wavelength of above 520 nm. What objective magnifications are available with the ParaLens Advance? The ParaLens Advance is available with 20x, 40x, 60x, and 100x objectives. If I do not have a microscope, is there a microscope available with the ParaLens Advance? Yes. Drucker Diagnostics can provide a microscope as an accessory to the ParaLens Advance system. What are the power requirements of the ParaLens Advance? The ParaLens Advance power pack uses 100-240 VAC and comes standard with international plug adapters for use in any country. Numerous other portable power options are also available, including a USB cord, solar battery pack, and 12-volt battery clamps, among others. Where is the ParaLens Advance available? The ParaLens is available globally. Is there a discount available for volume purchases or for educational purposes? Yes, please contact Drucker Diagnostics directly for more information. Do you still sell the original ParaLens Microscope Attachment? No. The ParaLens Microscope Attachment is no longer for sale. 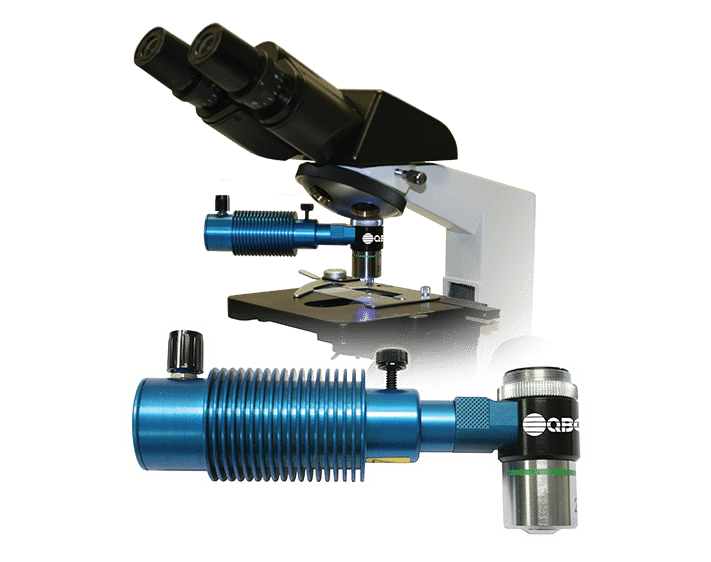 Maximized Resources - The ParaLens Advance upgrades any compound light microscope, allowing users to make greater use of their current equipment and resources. Increased Efficiency - Thanks to the increased speed and efficiency possible with the ParaLens Advance, users can expect faster review and greater lab throughput, minimizing hassles and extra expenses due to delays. Reduced Training Needs - Since the ParaLens Advance uses an existing microscope, microscopists will not need to be retrained on and become comfortable with a totally new microscope, reducing technician training time and expense. Reduced Maintenance Costs - The ParaLens Advance LED light source is designed to operate for a lifetime, unlike conventional fluorescence products that require regular replacement of costly light bulbs. For all service inquiries, please contact the Drucker Diagnostics Technical Service Department at +1-866-265-1486 (US only) or support@druckerdiagnostics.com. Our Technical Support Representatives are available Monday - Friday, 8:30 am to 5:00 pm (EST). The ParaLens Advance comes with a one year limited warranty from the date of original shipment from Drucker Diagnostics. For more information about the ParaLens Advance's limited warranty, please consult the ParaLens Advance Operator's Manual. Fluorescence microscopy technology has been used widely in tropical diagnostics and has shown significant utility for many microbiological assays. Listed below are abstracts and links for scientific articles that report or discuss the utility of fluorescence microscopy for many different applications. Minion, J., Sohn, H., and Pai, M. (2009) Light-emitting diode technologies for TB diagnosis: what is on the market? Expert Review of Medical Devices (6)4: 341-345. Ramsay A, Cuevas LE, Mundy CJF, Nathanson C-M, Chirambo P, et al. (2009) New Policies, New Technologies: Modelling the Potential for Improved Smear Microscopy Services in Malawi. PLoS ONE 4(11): e7760.doi:10.1371/journal/pone.0007760. Armstrong, D. (Dec. 2009 / Jan 2010) LED-based fluoroscopy and the Paralens system: illuminating the future of TB diagnostics. Clinical Laboratory International. Walter Kuhn, Derek Armstrong, Suzanne Atteberry, Euline Dewbrey, Diane Smith, and Nancy Hooper (2010) Usefulness of the Paralens™ Fluorescent Microscope Adaptor for the Identification of Mycobacteria in Both Field and Laboratory Settings. Anthony, R.L., Bangs, M.J., Anthony J.M., and Purnomo. (1992) On-site diagnosis of Plasmodium falciparum, P. vivax, and P. malariae by using the Quantitative Buffy Coat system. Journal of Parasitology. 78(6):994-8. Bailey, J.W. and Smith, D.H. (1994) The quantitative buffy coat for the diagnosis of trypanosomes. tropical Doctor 24(2):54-6.